Hello again! I have another card to share with you today, but hopefully I will be back sharing some of the scrapbook pages I was able to put together earlier this week. It's a late night tonight (I know, it's only 9:00, but my 5 year old is still up, and my husband just got done working (officially) for the night. We just got back from a family get together as my uncle and aunt are heading back to Georgia tomorrow (via Tennessee, but hey, close enough). So I thought I'd stop in and make a quick post while Daddy is reading to him. He's so into Henry Huggins this week. Well, I'm off to help with teeth brushing! Have a great night and happy stamping! How adorable!! Sweet image....and colored nicely! 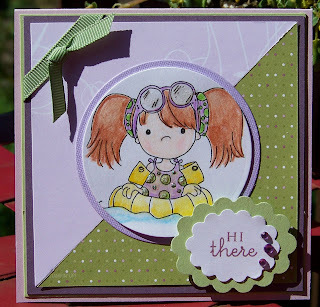 Cute - love the sketch - and cool that you put the crystal effect to make her goggles look more realistic! Too cute...I love tiddly inks!